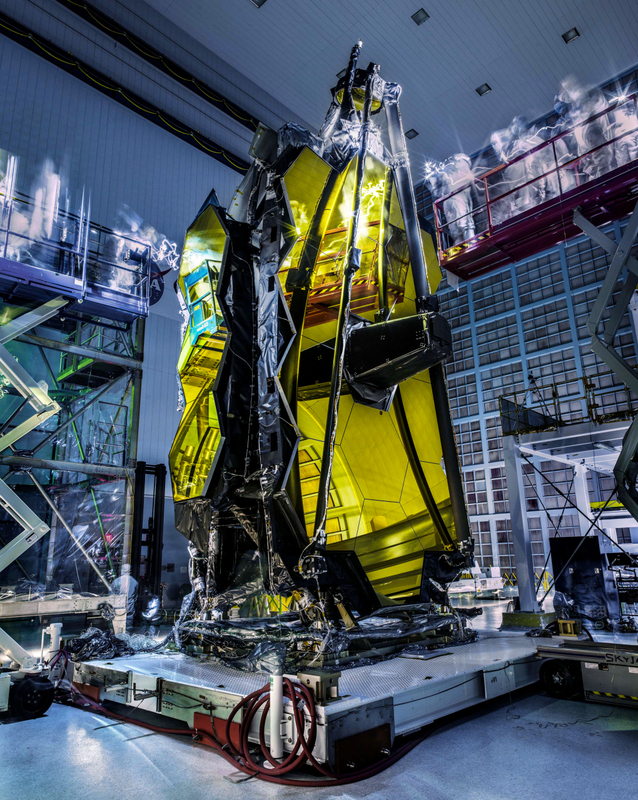 After completion of its vibration and acoustic testing in March, the James Webb Space Telescope – JWST – is shown here undergoing a detailed 'lights out' inspection in one of NASA's cleanrooms at the Goddard Space Flight Center. This is a special type of visual inspection to check for any forms of contamination. Both bright white LEDs and UV lights are used in order to better search for possible contamination, with the lights inside the cleanroom switched off to improve the contrast. The low lighting means the image had to be taken with a longer than normal exposure time. This makes the technicians appear somewhat ghostly as they moved about the cleanroom during the exposure. The image shows the segmented and gold-coated primary mirror of the telescope, which has a diameter of about 6.5 m when unfolded. It consists of 18 hexagonal segments, which will work together as one gigantic state-of-the-art mirror. In order to fit inside the Ariane 5 rocket that will boost it into space, some segments will be folded, which will then open in orbit. By the end of April, the telescope and the instruments will be shipped from NASA Goddard Space Flight Center in Maryland to Johnson's Space Center in Texas where, over the course of the summer, it will go through final cryogenic-temperature testing. JWST is joint project of NASA, ESA and the Canadian Space Agency, and is scheduled for launch in October 2018 from Europe's Spaceport in Kourou, French Guiana. This image was first published on 15 March via the NASA JWST pages.